As governments around the world focus their efforts on curbing pollution, the demand for alternative means of deriving power will surge. Against this backdrop various markets recorded tremendous growth in the recent past, the global solar charge controller market being one among them. Transparency Market Research has opined that the market is currently in a transitional phase, chiefly driven by various government initiatives and the shifting preference toward renewable sources to derive energy. Coupled with this, technological innovations and commercialization of solar charge controllers will ensue robust growth in the market. Contrary to aforementioned growth drivers, the market players often incur huge expenses on installation. Furthermore, the maintenance cost of solar charge controllers is really high, thus hindering the smooth sail of the market. Nonetheless, the rising investment in infrastructural development and continued advancements in technology will offer immense opportunities for the growth to the global solar charge controller market in the coming years. To present an in-depth overview, the report segments the global solar charge controller market in terms of type and end use, part from region. Based on type, the solar charge controller market is classified into pulse-width modulation (PWM) charge controller, maximum power point tracking (MPPT) charge controller, and simple 1 or 2 stage controls. Of these, TMR has observed rising penetration of PWM across diverse end-use industries. A PWM solar charge controller snips excess solar voltage, which in turn results in a loss of total power. As a result, the excess voltage generated by the solar array is reduced to the voltage value of the battery. Over the last couple of years, PWM solar charge controllers is therefore witnessing high demand. However, in the coming years, the MPPT segment is likely to gain momentum, as it has been established through tests that MPPT charge controllers outperform PWM charge controllers in cold and temperate climates. By end use, utility scale, commercial and industrial buildings, and solar home systems constitute the key segments in the global solar charge controller market. Of these, holding the largest share in the market, utility scale emerged dominant in 2016. Besides this, impressive growth is on cards for industrial and home systems segments as the world realizes the benefit of solar power. 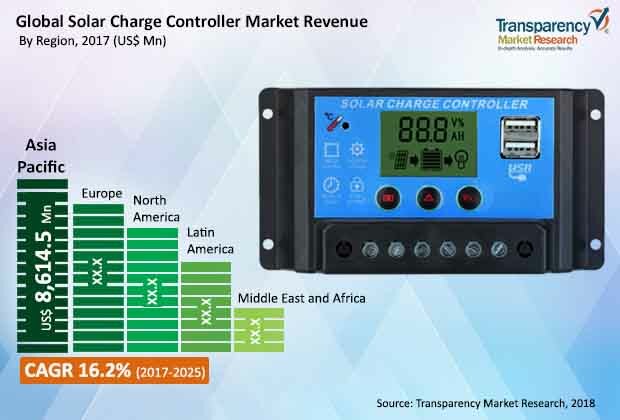 In terms of region, the global solar charge controller market has been classified into North America, Europe, Latin America, Asia Pacific, and the Middle East & Africa. Among these regions, Asia Pacific holds the maximum share in the global solar charge controller market. The rising demand for solar charge controllers from economies such as India, China and Japan will create lucrative prospects for the market in the region. The Asia Pacific market is also estimated to be exhibit the highest growth during the course of the report’s forecast period due to the increase in the demand from industrial and residential segments. Demand witnessed in Europe and North America might get a little affected in the coming years as they are mature markets, while the Middle East & Africa and the Latin America are identified as emerging markets and are expected to show considerable growth opportunities during the forecast period. Key players in the global solar charge controller market are expected to benefit from the emerging market. Prominent players in the global solar charge controller market are OutBack Power Inc, Xantrex Technologies, Genasun LLC, Luminous Power Technologies Pvt. Ltd, Wenzhou Xihe Electric Co., Ltd, Phocos, Beijing Epsolar Technology Co., Ltd, Steca Elektronik GmbH, and Sollatek among others.